Over the last century, millions of readers from all over the world have come to know and love Anne of Green Gables™, and Prince Edward Island is where devotees come to celebrate her. Those who love the books or the TV miniseries make their way to Green Gables Shore in pilgrimage-like fashion to visit the many sites that pay tribute to their favourite red-haired heroine and her creator, Lucy Maud Montgomery. While Anne may be the principal attraction for many, Green Gables Shore has more beauty and mystique up its sleeve. The region is a spectacular piece of Prince Edward Island’s acclaimed scenic landscape composed of red sandstone cliffs, white sand beaches and rolling farm fields. 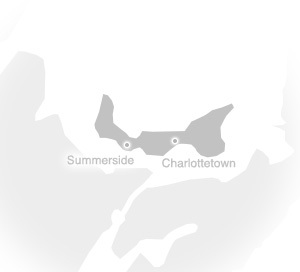 Some of the classic coastline has been protected in PEI National Park, which hugs the north shore in this area. Cavendish Grove is a lovely recent addition to the Park, featuring walking trails, picnic grounds and a stand of sugar maples. Golfers have a hard decision to make since Green Gables Shore has more than 11 courses located just minutes apart. For family fun, spending time in Cavendish is a must-do. There are amusement parks, mini golf, water slides and restaurants that cater to all ages and tastes. Just down the road, in North Rustico, adventure seekers can choose from kayaking, canoeing or deep-sea fishing. Give in to the lure of the sea and head out onto the ocean for a fresh perspective of the stunning coastline. Back on land, couples and families can take a trip down memory lane at the local drive-in theatre. Or, for a unique way to get those romantic sparks flying, you can treat your partner to a dance lesson inside a completely refurbished pig barn in Wheatley River. The owners are former amateur champions and don’t mind a bit if you have two left feet. To awaken your spiritual side, be sure to take in The Indian River Festival Fine Music Series. It takes place at St. Mary’s Church, the largest wooden church on PEI, and its incredible acoustics make attending a concert here a truly heavenly experience. Green Gables Shore has a variety of accommodations to suit any type of getaway. There are lovely cottages, bed and breakfasts, historic inns and four-star resorts, or for those who prefer to be closer to nature, well-equipped campgrounds with easy access to the beach. Even if you have never heard of Anne of Green Gables™, this region can satisfy your wish for a variety-filled vacation itinerary that could include beach, golf, theatre, music, nature walks and sea kayaking–all within an easy 20 minutes of each other.